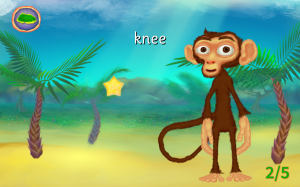 Monkey Bay is one many games coming to Langeroo Adventures which is designed to teach a particular topic. Many of our games, such as Tortoise Beach and our hangman-style Crab Waterfall game, can be played with any of our 25+ topics. 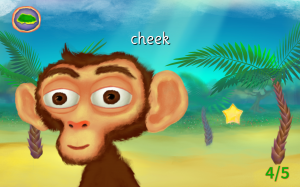 Monkey Bay, however, is designed to teach Face and Body words. It’s a really simple game for children to get to grips with. They see (and hear) the name of a Face or Body part, and they have to drag a Star Sticker to the correct place on our monkey. For face words (such as ear, or mouth), we zoom in to reveal just the monkey’s face to make dropping the sticker easier. For body words (such as foot, or tummy), we zoom out so the child can see the whole monkey. 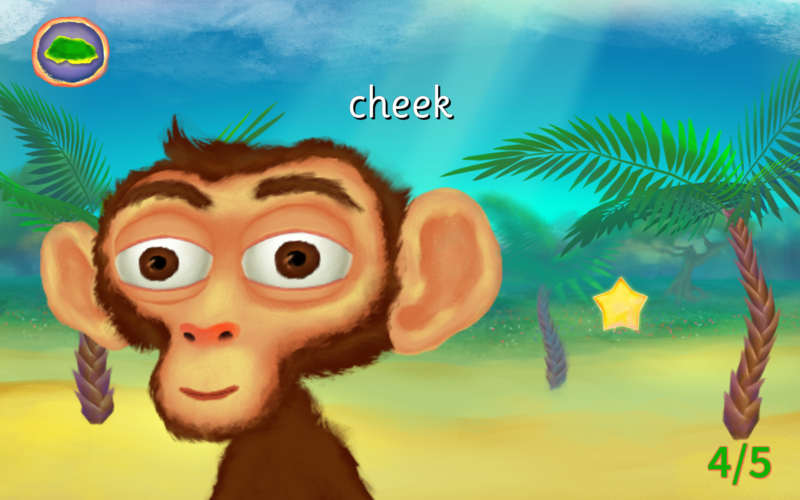 Our monkey has a ton of expressions, and he sways gently on the beach (to the amazing music, composed by Andrea Possee). If the child gets an answer correct, he gives a big grin and the next question appears. If the child gets the answer wrong, he’ll respond with a slight frown before letting the child have another go. Our Star Rating system is almost complete too, and will be included in every game in the collection. We’ll go into that further in a future post, but it encourages children to replay the games and improve their score, whilst focussing on their positive achievements and progress. In the meantime, follow us on Facebook for the latest news and photos as we finish development on Langeroo Adventures!